Design and manufacture a lifting fixture frame to be used for lifting, manoeuvring and installing air conditioning units. The lifting fixture frame will be manufactured from 127mm x 76mm x 13mm RSJ and is supported with 10mm and 15mm gussets. The lifting fixture frame will be certified with a SWL of 1000kg and supplied with four 7mm chains cut at 350mm long along with four 2 tonne Dee Shackles. The lifting fixture frame will have provision for hanging the four chains in two separate positions for optimised lifting and performance. The lifting fixture frame will be delivered with a transportation trolley which will be manufactured from 60mm x 60mm x 5mm SHS. 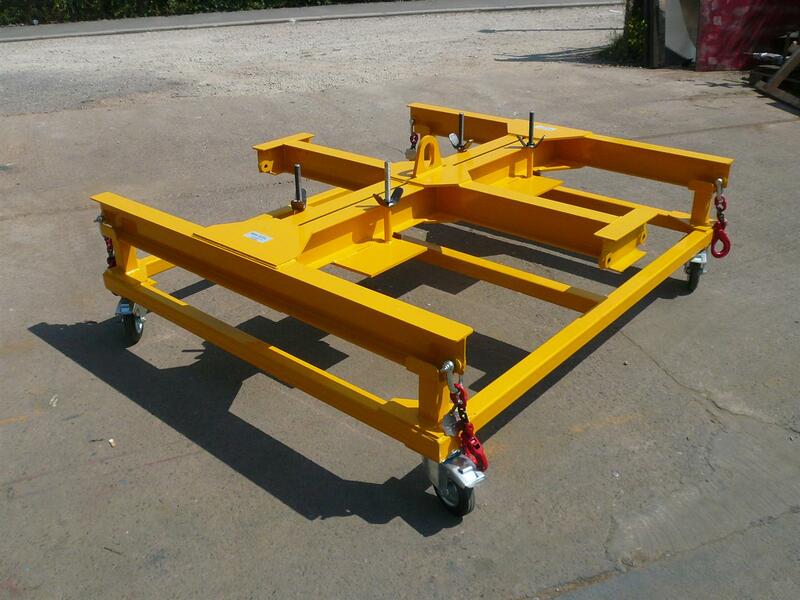 The lifting fixture frame will sit 130mm from the trolley, and will rest on four posts. The trolley will be fitted with four 160 diameter swivel/ brake castors with a black rubber tyre/ metal centre.